Zhangjiajie's Stone Forest in China's Hunan Province has been more or less out of the international tourist radar in the past, but that is about to change. 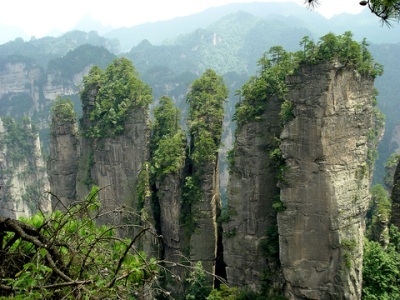 Zhangjiajie's Rock Column Forest, or the Southern Sky Columns as they are also known, claim to be the model behind the striking hanging mountain scenery in the movie Avatar and have been getting a lot of attention as a result. As you wander around the park, it is easy to feel transported to the Hallelujah Mountains in the Planet of Pandora... many are flocking to see the beautiful scenery and enjoy all this area has to offer. 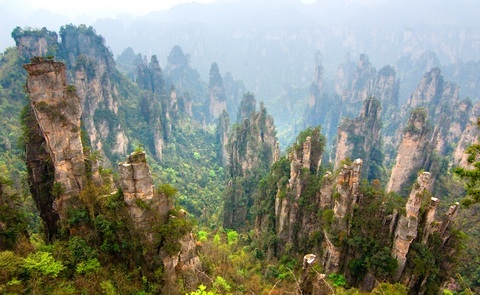 The entire Wulingyuan Scenic Area where the Zhangjiajie National Forest Park is located, includes over 3,100 sandstone pillars of varying heights with some reaching over 800 meters, lush valleys and dense forests, lakes, caves, waterfalls and streams, all spread over an area of approximately 266 square miles (690 square kilometers). It has been designated a Unesco World Heritage Site and a Unesco Global Geopark. The area is also home to several ethnic groups, the Tu, Bai and Miao minority groups inhabit the area, adding a very special cultural and historical element to any visit to this beautiful place. To do it justice, a 4-5 day visit is recommended as there is much to see and do. 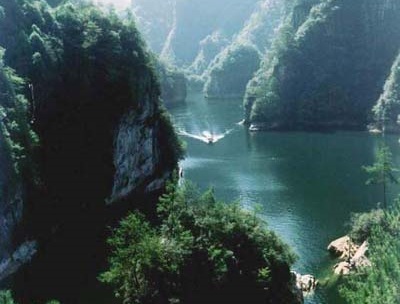 This is China's first National Park, the beautiful peaks and rocky formations are concentrated in six main scenic spots and over 90 smaller ones. 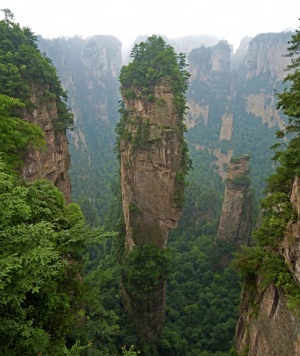 There are five entrances around the Zhangjiajie mountains. 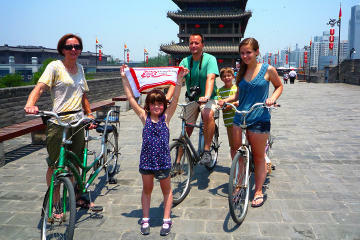 The two main entrances are Zhangjiajie Village in the West side of the park, and the Wulingyuan entrance in the East. Most hotels and accomodations are found here. Among the highlights are Golden Whip Stream, Yuanjiajie in the northern part of the park, South Heaven Pillar and Five Finger Park pictured above. Also at the Park you find the Bailong Elevator which runs alongside one of the cliffs at the end of Golden Whip Stream and brings you to the top of the peaks at a height of 326 meters. The glass elevator allows for a thrilling ride, as you come up the first 154 meters through the underground shaft and suddenly are face to face with this beautiful stone forest. It is China's highest elevator, and perhaps the world, however, its future is uncertain as it was built without consulting the World Heritage Committee in 1999 and construction of new structures is forbidden. 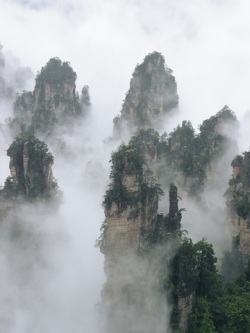 Tianzi Mountain or Heaven's Son Mountain is best known for its tall peaks surrounded by fog and mist, peaceful sunrises and awe inspiring sunsets. 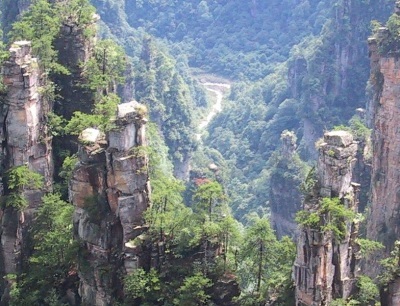 This mountain range is at a higher elevation and located in the Northern side of the Wulingyuan Scenic Area. The highest peaks reach over 3,900 feet or 1,200 meters above sea level. Because of the higher elevation, you can enjoy views of the entire Wulingyuan Area from the top of Tianzi Mountain. There are over 100 natural viewing platforms through the Reserve. Cable cars bring you to the summit in minutes and the ride in itself is a treat as you float over the peaks and this wonderful landscape. The views vary according to the season, or even the time of day as you climb up higher. Cool temperatures of about 12° C or 54° F are the year round average. The Yellow Dragon Cave with its beautiful formations, but watch out grandma and grandpa as there are some challenging steps here. Yaozizhai is an off-the-beaten-path little visited mountain, very attractive for more adventurous families that want to do some hiking. Rafting in the Mendong river offering some challenging rapids. The Ancient town of Fenghuang, about 4 hours from Zhangjiajie, home to the Miao minority group, where you can experience this colorful culture.